Lying is an art form in the Trump clan. Being dumb also goes with the territory. Our Liar-In-Chief is so dumb it hurts to look at him. It doesn't help that he's proud of the fact that he doesn't read. Fun fact - all White House morning briefings have to be under a page, or Donny's attention wanders off. Graphics are also very important to keep him focused for a few minutes. And then there's the apple that fell from the same tree of stupidity...Don. Jr. 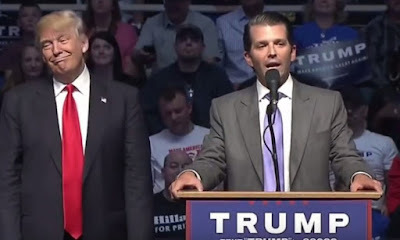 I'm sure he makes his dad proud when he lies to investigators about colluding with Russia - and now about two more foreign governments - that wanted his daddy to win real bad. Mueller is already investigating a meeting at Trump Tower involving Don Jr. and other Trump associates looking for dirt on Hillary Clinton. In June 2016 a foreign government - Russia - supported Trump and did everything it could to get him elected. And now, thanks to the New York Times, we find out that Don Jr. was a very busy boy drumming up support from other foreign countries that wanted his dad to win the election. A small group gathered three months before the 2016 election. It consisted of two wealthy Arab princes, an Israeli specialist in social media manipulation, and a Republican donor with a controversial past in the Middle East as a private security contractor. One of Trump's most prominent supporters, Erik Prince, the former CEO of the controversial security firm Blackwater, now called Academi, and brother of Education Secretary Betsy DeVos, organized the meeting, according to the Times report. The two wealthy Arabs were there on behalf of their countries: Saudi Arabia and The United Arab Emirates. They must have gotten their piece of the Trump pie along with the Russians when you think about the elaborate reception Trump got when he came to Saudi Arabia as a newly minted American president. Then there was the time Don. Jr. claimed daddy didn't know a thing about the Trump Tower Russia meeting, got caught lying about it, and changed his story...as daddy dictated a new response to the media for his dumb son. I could go on, but enough about past bumblings. I'm enjoying watching the current dumb things junior and dad are saying almost daily. It's (stealing the presidency with a little help from foreign friends) been an excellent adventure thus far. I can't wait to see the conclusion.